A business trip with TJFrog was sold on the promise of lunch at Skye’s wonderful pie cafe where, as the name suggests, they serve the most delightful pies. 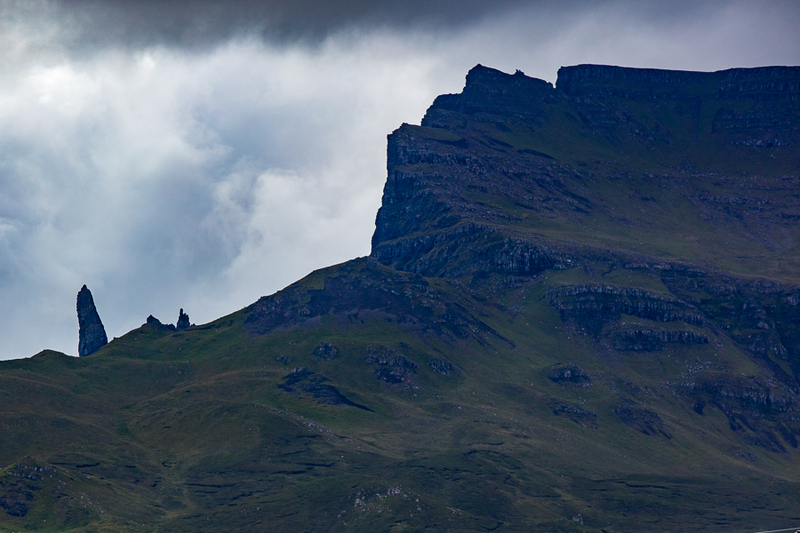 However the pies are not the only attraction to visit a cafe located in the heart of the Trotternish Ridge. The journey north along the Quiraing is now an iconic view on Skye whilst within the cafe, a knitters delight, there was a centre piece display which even I had to admit was an impressive piece of crochet sculpture. Above looking back towards Portree, the Old Man of Stor is just visible on the right which also shows the clear scarp and the land dipping towards the sea and the outlying islands. Below a sense of the ridge line from South to North. The North West of Skye is a landscape formed by huge lava flows that covered the underlying Jurassic Sedimentary rocks. 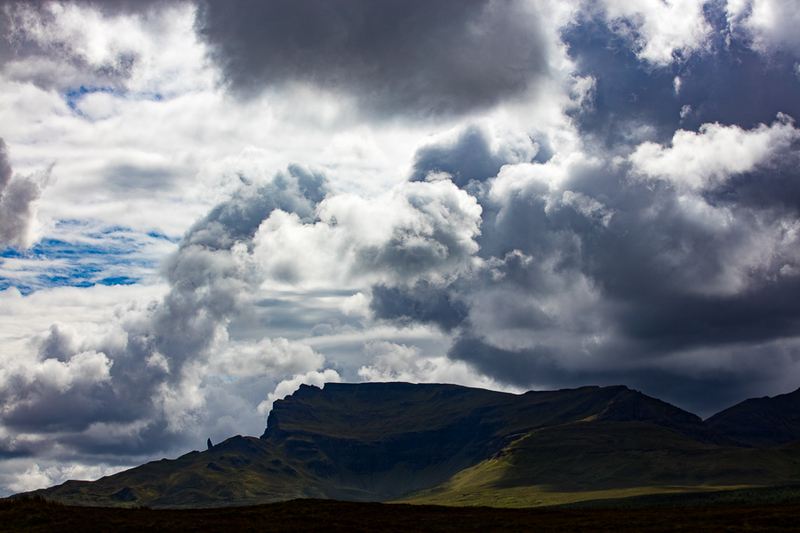 The weight of the lava, over 300m thick in places, has exploited faults in the rock and the slippage has caused the formation of the 20mile (32km) Trotternish Ridge, the Quiraing. In geological terms the rock is still as crumbly as the super short pastry in the pie cafe and it is this unstability that has helped cause some of the geological formations that first attracted walkers and photographers before film makers used it for sci-fi / majestic moody backdrops and the subsequent hoards of ‘lets go to where that was filmed holiday makers’ followed. Their £s & $s are welcomed some other aspects of too many people are, I feel, beginning to erode the very landscape they come to visit. Rock, like some of the delicate plants that grow on it, can be a fragile eco-system. On the day we were driving through it was the skies as much as the landscape that was making the panoramas so appealing. The day wasn’t about spending time to get the perfect landscape shot but hopefully these few images give a sense of the setting and the backdrop to the Skye Pie Cafe. The advantage of shooting slightly further away is you do not get to see all the people, like little ants, wandering around the area. I will return in the winter with a little more time and capture the scene again with a little more solitude. From the moment you walk through the front door you notice that there is something different, something slightly quirky about the Cafe. 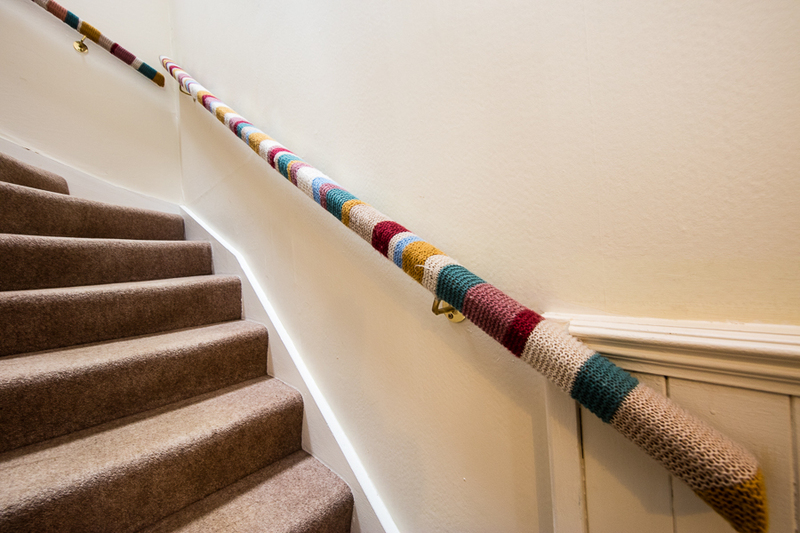 Clearly the stair rail feels the cold in the Winter. 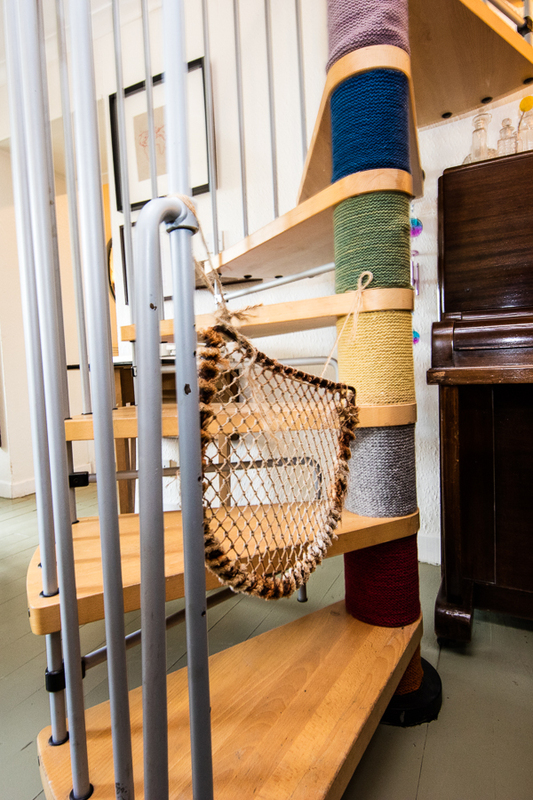 Likewise the spiral staircase, where part of a lobster pot reminds you that the stairs is out of bounds to inquisitive children. 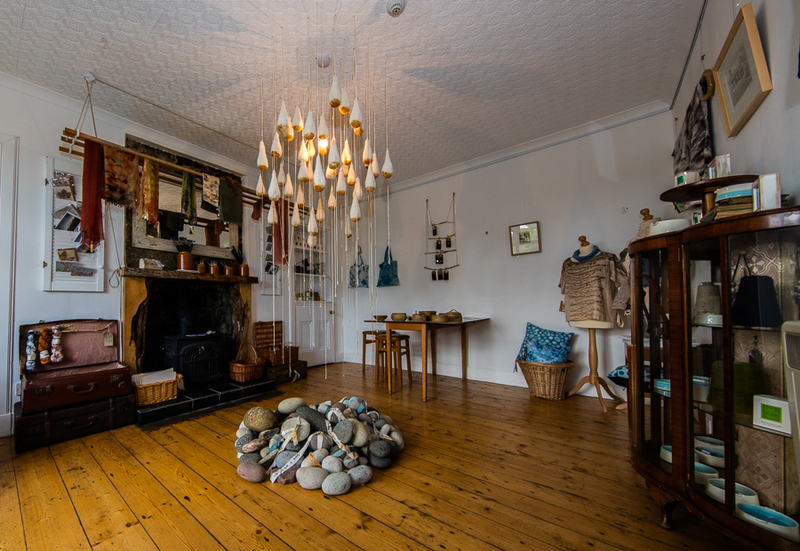 One room is designated the gallery and is dominated by its centre piece work of art which is left from an exhibition called “Imprints of Time” that ran through the month of May. 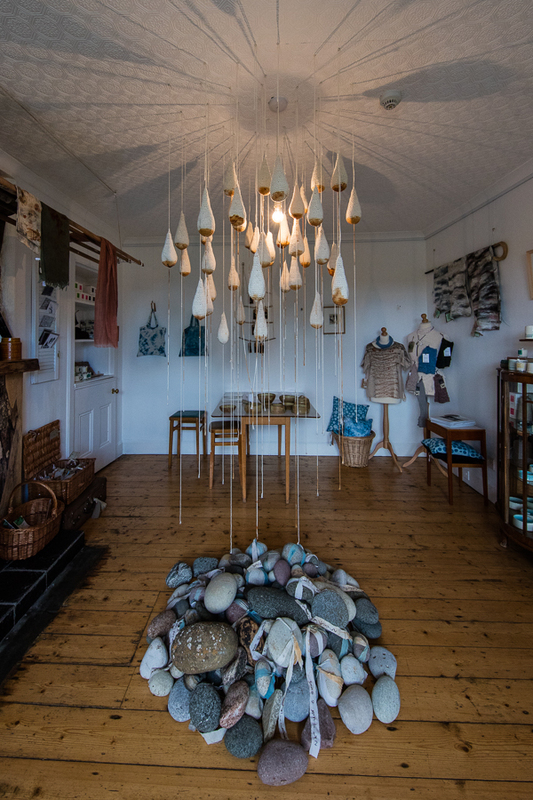 The exhibition featured work from three artists who came together to produce an exhibtion inspired from the views from the cafe and the local way of life and how this has changed through time. 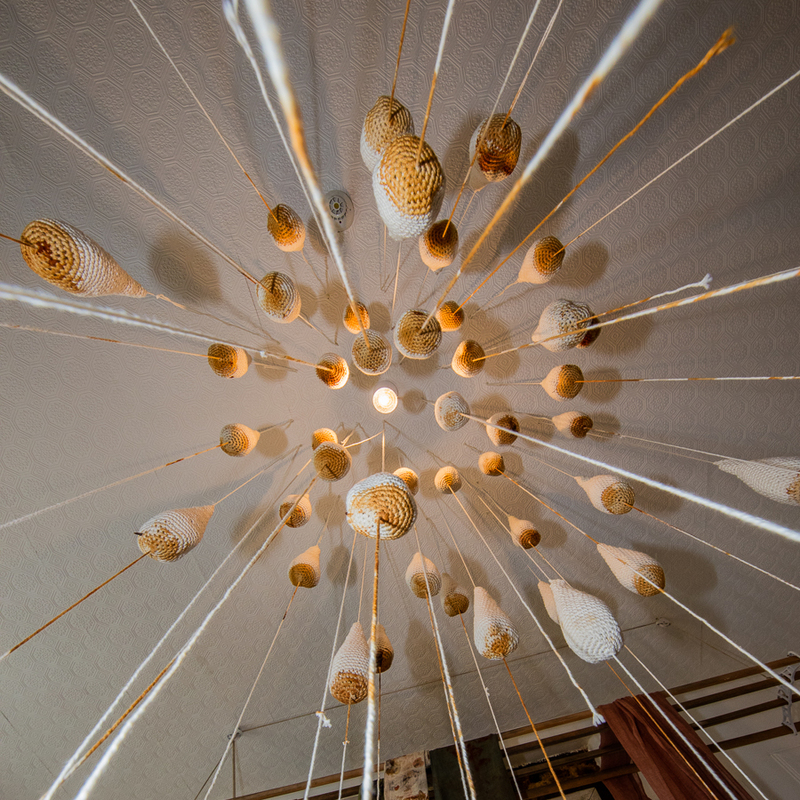 This remaining piece (above) was created by Kirsty Faulds, who runs the cafe with partner Simon Wallwork. 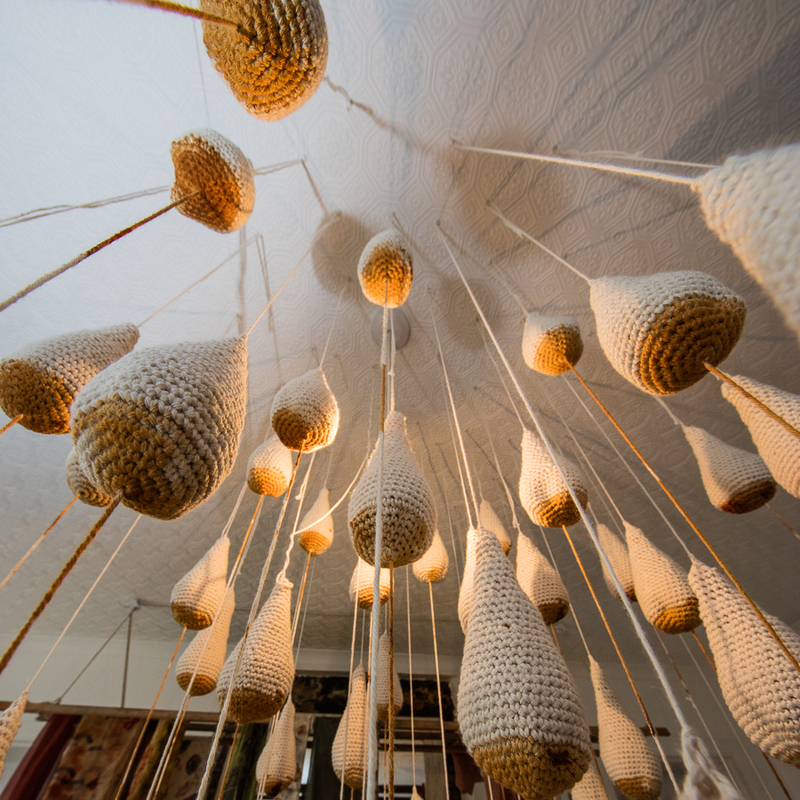 The pods hanging from the ceiling are crocheted from naturally coloured yarn and (I think) contain nails. As the nails rust over time so the pods gradually shape their colour with the bottom part of the pod developing its own deep rust colouration. And though the trip was ‘sold to me’ on the quality of the pies even this luddite of the textile world was impressed by the effectiveness of a very different work of art.